HIGASHI KAGAKU carries out on "made to order" basis the development and manufacture of latex compounds made from natural and synthetic latex, PVC paste etc. One feature of our services is by deputing an exclusive technician to serve as the sales representative for a particular customer for one-to-one response for his specific needs. Each technician is responsible for all stages for his customer throughout the whole process, starting from the initial consultation and throughout the development of the latex compound, presentation of the test samples and shipment of the final product. This ensures the smoothest possible communication between ourselves and the customer which enables a more personal and detailed response to their needs, in addition to more accurate in-house administration and quick decision-making that is appropriate to the circumstances. The technician-in-charge first determines the initial product specifications based on a series of consultations with you regarding your requirements, purpose and conditions of use. 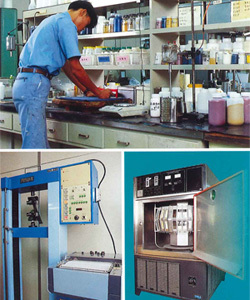 Development and testing is then carried out and the technician presents you with a resulting sample product. Real-time testing on your own equipment is performed and, once it is agreed that the sample meets all the requirements, the specifications are finalized, the final amount or number of items to be manufactured is set, and the delivery schedule is established. If further corrections are required, improved samples will be presented until all requirements are fulfilled. Because all the quality data, samples and video are recorded and archived for production lot of each and every product, you can leave all of your after-sales service needs to us with absolute confidence. Copyright (C) HIGASHI KAGAKU All Rights Reserved.